Gbolahan Enilolobo, the state coordinator of the council, disclosed that 412 teachers sat for the maiden edition of the examination. He said the failure of the teachers was mainly because they were not conversant with the use of the computer, adding that many of them are not digitally compliant. The TRCN had on October 14 conducted the examination for the teachers, through Computer Based Test, CBT. The examination was to qualify the successful teachers to register as professionals and be licensed with the council. According to Enilolobo, the unsuccessful teachers will have to re-register for the examination, and after three consecutive attempts, if they still fail, they will be disqualified. “About three of the teachers exited without even completing the examination, indicating their being unfamiliar with the system at all. “But if failure occurs consecutively for three times, it means disqualification, and such teacher cannot be licensed,’’ he said. Giving statistics of the teachers in attendance, Enilolobo said one Ph.D holder, 30 Masters degree holders, 282 First degree and 99 holders of National Certificate of Education sat for the examination. Meaning that nine teachers out of 30 the master’s degree holders that sat for the examination failed. According to him, 257 out of the 282 first degree holder passed, while 82 passed of the 99 NCE holders. 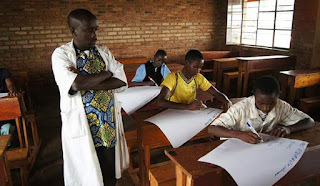 The coordinator said the teachers were the first set to write the examination and they were a bit disadvantaged because there were no past questions to enable them familiarise with the national benchmark of the examination. “Teachers should align themselves with computer so as to reduce the number of failures,” Enilolobo also advised.